What has been one of my biggest classroom management challenges this year? Requests from students to go to the nurse. If you are an elementary school teacher you understand. I am pretty sure I get 300 or more requests to go to the nurse during the 180 days of school. And imagine all the requests my students have given to recess teachers, cafeteria staff, and and specialists. I'd guess that would add at least 100 or more (at least one or more happens every day to my knowledge and I know there are plenty I don't know about. I wonder if middle school or high school students ask to go to the nurse as much as the younger ones. Comment and let me know. And disclaimer here before I start, which I will elaborate on more below, yes, I do SOMETIMES let kids go to the nurse. Probably 1-3 times a week I say yes. There are definitely emergencies such as a kiddo falling down at recess, a bloody nose, someone is throwing up, or when I look at a kiddo and they look green, white, flushed or just "not right" and I know they need some help, help you can't give them in the classroom. And for those of us lucky enough to have a school nurse, we are VERY lucky! I can't imagine how it is for those of you who do not have a full time nurse, have only a part time nurse, or no nurse at all (what the heck is wrong with that picture, right?). 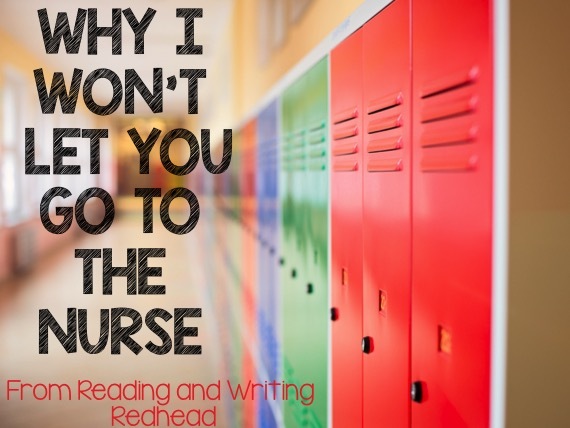 So why do I rarely (note, I say rarely, not never) let students go to the nurse? Read on to see and if you think this post is useful, informative or helpful, please feel free to share it on social media! She might need some TLC or attention. She also could need a break or to move around, or a combination of both which we call a movement break at my school. Enough said. I can't tell you how many days in the spring once it hit about 65 degree or warmer that kiddos came in from recess saying "My head hurts" or "My tummy hurts" or "I don't feel good". Not surprisingly, those types of post-recess somatic complaints increased along with the increase in temperature as we got into May and deep into June. Most of the time, once kiddos' heart rates come down, and they get a drink and stop sweating (unless of course, it's 90+ in the room, in which case the sweating continues), I don't get any repeats of the complaints. Speaking of that, many times, it seems my magic response of "Try taking a drink or two from the water fountain" (or your water bottle) seems to clear it right up. In which case, the nurse is not the right person for this- at least not in most schools. Most school nurses are completely overwhelmed and overworked with students with injuries, requiring med administrations, inhalers, students who have vomited, have lice, etc. With vague complaints, a nurse might take a temperature and then send the kiddo back to class. If the student is experiencing real anxiety, her parents, the guidance counselor (or if the school is lucky enough to have one, school psychologist) should help you support her, and if it is an ongoing issue, school staff sometimes will recommend the parents talk to a pediatrician about it and maybe even consider an outside therapist. Sometimes with our kiddos, there is real anxiety there, a diagnosis can be made, and we can implement useful accommodations to help. I truly respect the intelligence, talent, and hard work a school nurse does, but shuffling a kiddo to the nurse that might be anxious in most cases only delays addressing the core of the actual problem. This actually sometimes goes along with number 4. Sometimes students feel anxiety about learning and their schoolwork but if she is nervous about the assignments, or feels she isn't doing as well as she should, by going to the nurse, she may miss more important instruction and come back feeling confused and behind her peers, reinforcing the cycle. I don't know about you, but for example, right after recess, the nurse at my school is completely overwhelmed. Between legitimate injuries, giving kids inhalers and nebulizers and dealing with at least one or more kiddo with an imaginary injury or illness, she often has 6-10 kids in her office. As I explained to my last class several times, if all the teachers in the school send one kiddo to the nurse at the same time, she'd have at least eighteen students! At our school in the past (but honestly, I don't know about last year or this year) I know she has bought cough drops for kids out of her own money, and once a few years ago she told me she ran out of bandaids and bought some herself, and I replied, "We teachers can ask parents to send in boxes of bandaids to donate for you" and we got a bunch to hook her up until the school restocked her bandaid supply. I don't know about your district, but our nurse just should not be put in the position where she is buying her own supplies. I don't want kiddos who don't need things from the nurse to be taking them, since they should be for those who really need them. Okay, so you ask, if I am a teacher, how do I deal with the problem of lots of nurse requests. This is what has worked for me. If you have suggestions to add that have worked for you, please comment and let us know! Keep band aids in the room and in individual desks. Don't allow kids to "walk" their friends to the nurse-unless the friend is extremely upset or can barely see where they are going (such as when I had the girl who accidentally stapled her finger. YIKES). The friend who is just walking someone to the nurse sometimes mysteriously ends up with a bandaid, ice pack or cough drop. Discuss it with parents at Open House or Back to School Night - let them know your policy and ask parents to email or send a note if their child is injured, might be in pain, or is coming to school but has symptoms of illness. Communicate with parents as soon as you start noticing a kiddo who asks a lot. Nurse Passes- if you have a "frequent flyer", try giving them one or two nurse passes they can use during the week and when they are out, they are out of luck (except of course a real emergency). Incorporate movement and relaxation breaks into the day with GoNoodle or Youtube/your own resources. Discuss and explain your reasoning to students. Some, even very young students, will really get it. Incorporate the The 3 B's rule: Students who are bleeding, barfing or have broken bones can definitely go to the nurse - but other situations will likely get a no reply. Try a nurse log. We have talked about, but not yet implemented, a nurse pass/log system. We sometimes send kids to the nurse with a "stomachache" but they come back with an ice pack on their head. We discussed having a paper we send down with the symptoms and time, and she signs off on it they complained of the same issue, or a different one and what she does. Have you tried this? Does it work or help? Let us know what works for you when you get tons of nurse requests. Do you have a school policy? Your own? How does it all work? There is absolutely no nurse at our school. Even the youngest learn to apply a band-aid and stop a nosebleed. Is a student "feeling ill"? They take a drink and a 5 minute break in the classroom. Usually that is a sufficient cure. If there is a serious injury, they wait in a room off the office until their parent can come get them. All staff in are trained in first aid. Do we need a nurse?? In this day and age, I believe a full time school psychologist would be more important. Mental health issues are skyrocketing, even in kinder. Erin Condren Teacher Planner Giveaway! Back to School Products on Sale!